The weather vane used to be a rural icon that could be found on virtually every barn, church or town hall in North America. A late 19th c. A. B. & W. T. Westervelt American fire engine steam pumper weather vane sold recently for $59,000 in February 2017. The weather vane used to be a rural icon that could be found on virtually every barn, church or town hall in North America. While they could be quite decorative, their main function was much more than that; the weather vane was a predictor of weather, something very important when your livelihood and even physical survival depended on it. A rapid change in wind direction often indicated a change in the weather before even a storm cloud appeared on the horizon. 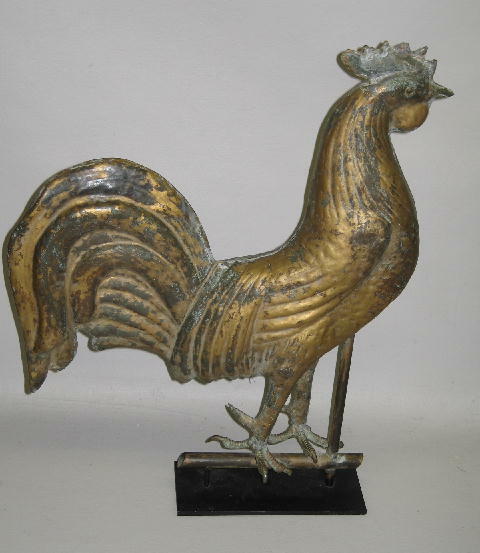 This full body copper rooster weather vane sold for over $4500 in February 2006. Weather vanes were made in many forms– hollow bodied from tin or copper, simple silhouettes in sheet metal, or cast zinc. They depicted everything from simple arrow pointers to elaborate trotting horses, the best known being the rooster variety. The rooster was used for a number of reasons, both functional and symbolic, the tall tail perfect for catching the wind and the rooster is very observant, the guard of the farm and the first to greet the new day. Weather vanes are not often seen these days in their original locations due to extreme increases in value during the 1980’s. Farmers were quick to cash in and the best of them were sold off legitimately due to the hot market for them, but many were stolen later if an owner refused to sell. Many a farmer came home from shopping in town to find the weather vane missing from its traditional spot on top of his silo or barn, sometimes the theft going unnoticed for weeks. No one is really certain of when the first weather vanes were used; in fact, their use probably predates written history. We do know the earliest examples being our own thumbs held in the air or a simple cloth pennant mounted on a pole. It was originally thought that the first examples of the modern weather vanes dated back to the Chinese and the Greeks, at least over 2000 years ago, but recent discoveries indicate they go far further back than that. Recently translated Sumerian and Akkadian literature mentions the existence of wooden weather vanes in the form of carved birds or sea-monsters in the ancient Mesopotamian civilizations as far back as 4000 years ago. 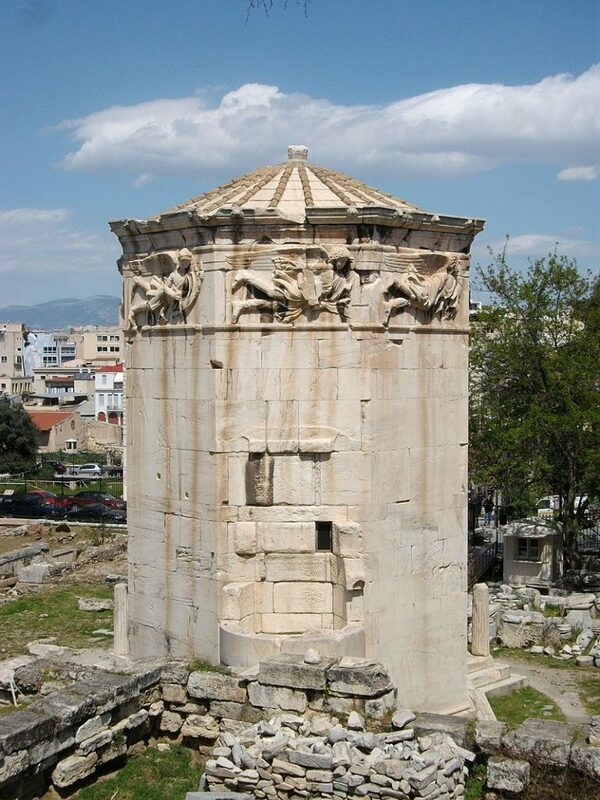 The Tower of Winds in Athens, Greece is considered to be the the world’s first meteorological station. The structure was originally topped with a weather vane depicting the sea god Triton. 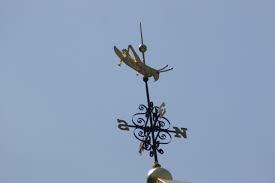 Faneuil Hall grasshopper weather vane in Boston, Massachusetts. 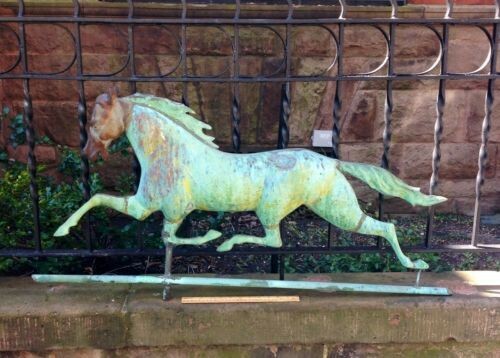 In North America, weather vanes existed from the earliest days, the first being simple locally made affairs. The first commercial varieties that graced most public and private buildings date to the 1700’s, the most famous of these being the grasshopper made by weather vane maker Deacon Shem Drowne and mounted on Boston’s Faneuil Hall (1742). Elaborate vanes like this were beyond the reach of average citizens. It was not until the Victorian era that commercially made weather vanes became cheap enough for the larger market. Smaller factories and foundries began springing up, and made vanes in large numbers, thus bringing the price down to the point they could be found for sale at local feed and general stores, or by mail order catalogs. The best known companies that made them during this period were J. W. Fiske, L. W. Cushing, Harris & Co., E. G. Washburne & Co. and A. L. Jewell & Co. This Fiske trotting horse sold for $4000.00 in April 2014. It is these commercially made examples dating from the mid 1800’s through the 1920’s that appear most often today in the market; values for them vary considerably by rarity, size and condition. It is not unusual for even the more common examples by J. W. Fiske, in poor condition, selling for more than $1000.00. According to our Worthopedia, a Fiske trotting horse sold for $4000.00 in April 2014. This gilded eagle pictured below sold for $4600.00. 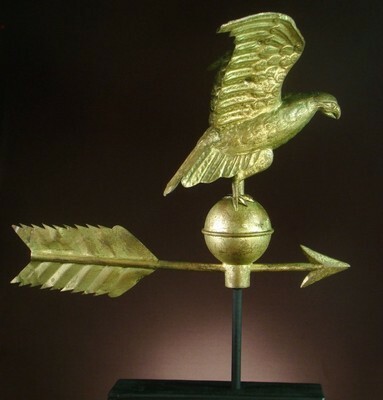 This gilded eagle by Fiske sold for $4600 in February 2013. The rarer examples can sell in the five figures, a rare butterfly example sold for $16,000. It doesn’t end there. The highest recent price I have for a weather vane is for a late 19th c. A. B. 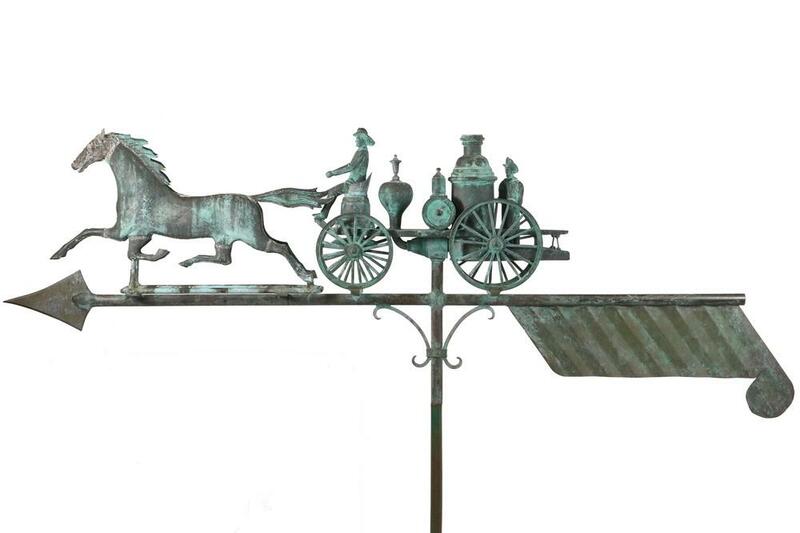 & W. T. Westervelt American rare engine steam pumper weather vane (see photo at top), drawn by two horses and having two cast firemen, in bronze, copper and zinc. It sold for over $59,000.